Check out this amazing automaton house now available on eBay! 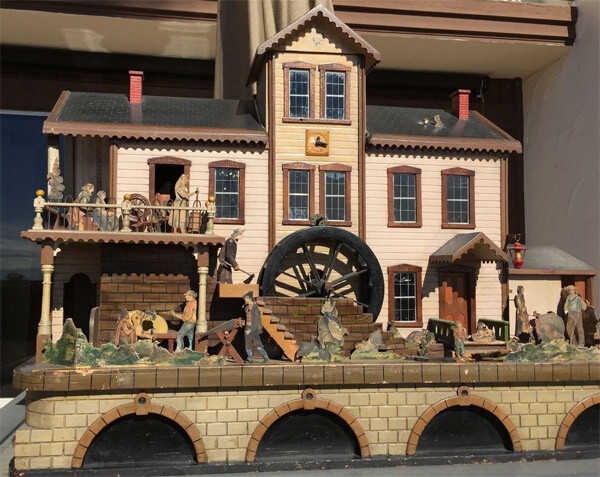 Mechanical Automata House: handmade between 1890 and 1930, this rare mechanical house displays a tableau of a working estate. A cart pulled by a goat rides in a track around the perimeter. People work various jobs outside and on the balcony, animals frolic and the waterwheel rotates in the center. Powered by a hand crank it is possible this machine was clockwork driven and still contains a mainspring that may have snapped. Evidence of an original clockwork mechanism exists in the form of an on/off switch, brass gearing and a ratchet and pawl. The vintage lithographed cutouts are applied to thin wood backing. Some are damaged by age and wear. Although we do not know the exact origin of this house it appears to have been made at the turn of the century. It is possible this is a limited edition toy or a one of a kind folk art tableau made from Victorian paper cutouts. Many parts of the house are hand carved. The origin of the house is unclear. It could be from Europe or the US. The condition of the figures in very good and the lithos contain most of their original color. There are a few things to replace, a few things to repair and depending of the buyer things to restore. There is a wooden stair missing, no harness for the goat, an arm needs replacing. Chickens need some maintenance to get them moving, the clock movement needs fixing, friction in the machine needs to be eliminated. The mechanicals need work but the belts and string pulleys are in good shape.